Forest Health Specialists are an important part of New York State Park’s Invasive Species Management Team. Their work helps protect native plants, wildlife and forests that are currently being threatened by two non-native invasive species: Hemlock Woolly Adelgid (HWA) and Emerald Ash Borer (EAB). Although these insects are very different from each other in appearance and behavior, they both cause significant destruction and mortality to their host trees. Hemlock Woolly Adelgid on hemlock stems. Look for small, white, cotton-like blobs on the underside of hemlock branches, right at the base of the needles. An adult Emerald Ash Borer emerging from an ash tree. Note the “D” shaped hole the insect has created, which is a sure sign you’ve found EAB. What do Forest Health Specialists Actually Do? The Forest Health Specialists are seasonal employees that travel throughout New York State conducting invasive species surveys and monitoring infestations in various Parks. They have training in field biology, forestry, and tree climbing. The team of two camps at the park of interest while completing their work. Surveys involve lots of hiking and investigating trees that look to be in poor health, taking photos, and recording information on location and observations made at each site. Although hiking in the woods isn’t a bad way to spend a work day, monitoring infestations of HWA is where the job really gets interesting. 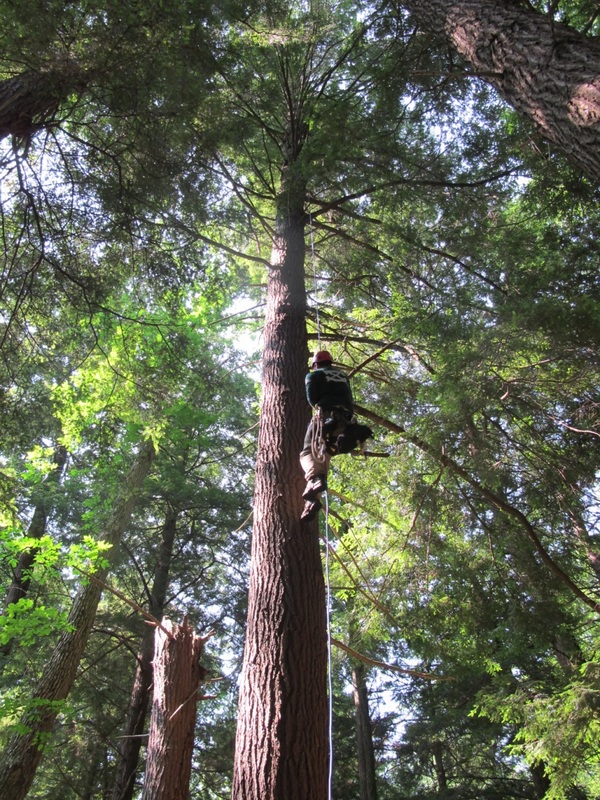 Specialists need to collect canopy samples from hemlock trees in order to see if insect numbers are declining or increasing. So, using a giant 8-foot slingshot, a line is shot high into the tree to a branch anywhere between 50 to 90 feet above the ground. Then a climbing rope is attached and pulled into the canopy and the fun begins! The Specialist, equipped with a harness and two ascenders (the name for special clips), climbs the rope upwards into the treetop. Climbing can be highly physical but is always rewarding. 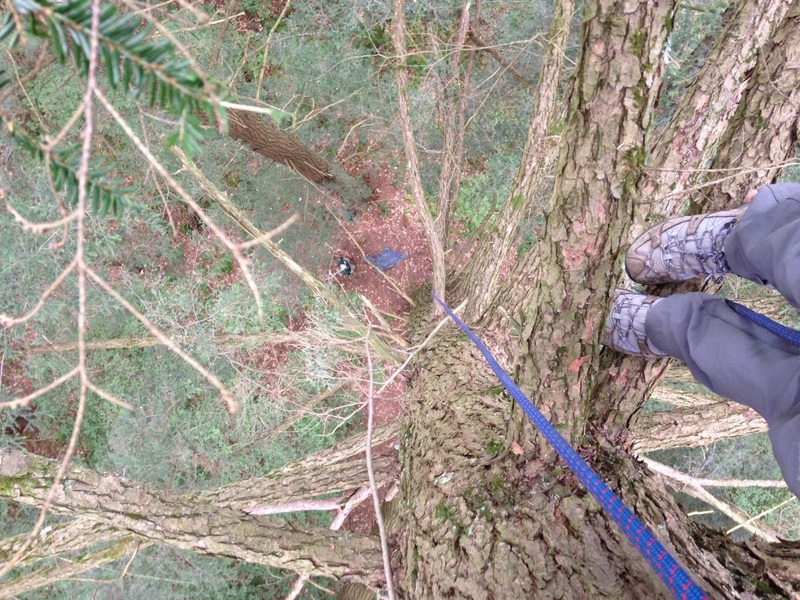 A Forest Health Specialist working their way up to the canopy using a climbing harness that is attached to the rope. Climbs typically take about an hour. A bird’s eye view looking down from the top of a hemlock. The tiny speck at in the bottom (in the green shirt and white cap) is the other team member! The goal of this program is to get a better grasp of where these invasive species are spreading, assessing their impact on the forests, and ultimately taking action to slow their spread and keep their numbers under control. It also allows biologists and managers to anticipate other impacts to wildlife or rare species; to plan for potential avoidance or removal of hazard trees along trails; and to help others understand changes they see in the forest and landscape around us. Of course a key component to the program’s success is you! By offering educational programs and volunteer opportunities, Forest Health Specialists also help people all over the state learn about invasive insects. The more people participating in and understanding invasive species in New York; the better chance we have of making a difference in our parks and our communities. Remember, the best way to stop the spread of Emerald Ash Borer and Hemlock Woolly Adelgid is to avoid introducing them in the first place. Don’t move firewood, take caution in moving landscaping debris around, and clean equipment and vehicles if moving from a site with these pests to somewhere else! Post by Kelly Blood (OPRHP). Photos by Kelly Blood and Alyssa Reid (OPRHP).